Why do French winds get such poetic names? In Provence, it’s the “mistral” that sweeps across Provence in winter, flattening fields of lavender with its bitter gusts. Along the west coast of Morocco, it’s the “alizé,” a trade wind blowing off the Atlantic. 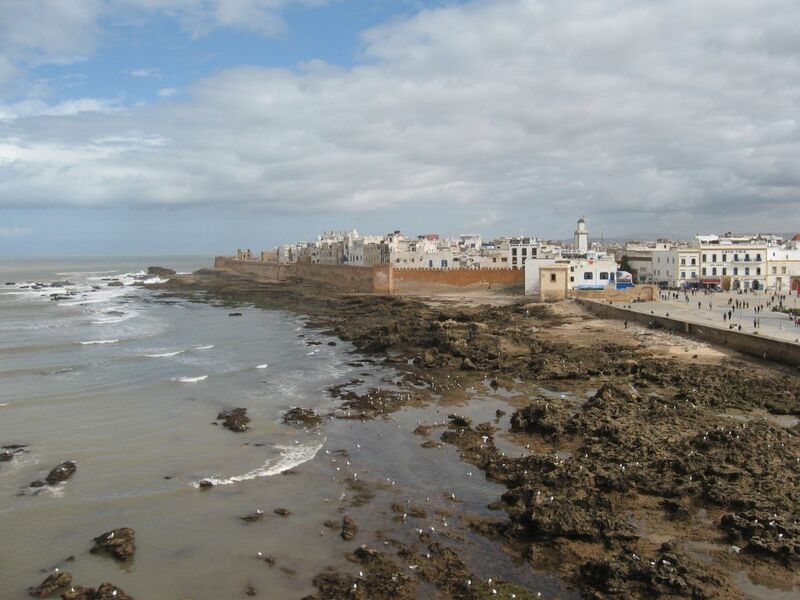 Sheltered from the surf by offshore islands, the port of Essaouira is nonetheless a notoriously breezy spot, attracting windsurfers and kite-flyers but relatively few sunbathers. Alizé notwithstanding, Essaouira seduces. The harbor town south of Casablanca, known as Mogador during the era of Portuguese dominance, has been variously home to Roman conquerors, Iberian explorers, French urban planners — and a prosperous Sephardic merchant community whose Jewish legacy remains one of Africa’s most tangible. There’s a wide-open sense of possibility on Africa’s occidental coast; for Europeans of yore, it was quite literally the end of the world. But Essaouira was long ago eclipsed as an economic power by Casablanca and Rabat, leaving its soulful walled medina (old town), crumbling Jewish quarter and stunning sea views for fishermen and adventurers. How this rabbi started in Lakewood and ended up at his first Pride Parade. 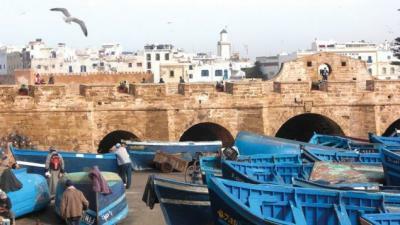 Yet Essaouira is hardly undiscovered. The city’s blend of exoticism and accessibility has made it a favorite Moroccan destination for those distinctive tribes of hippies, expats and boutique hoteliers who favor, for example, Ibiza. UNESCO anointed the 18th-century walled core, with its ramparts and golden citadel, a World Heritage site; a French architectural influence is obvious in ornate façades and graceful plazas. Since beachgoers tend to head elsewhere, the sociable souks and quiet, whitewashed lanes of Essaouira’s historic center remain relatively uncrowded. The choppy surf along Africa’s occidental coast was quite literally the end of the known world for Europeans of yore. Today, you can fly nonstop from the New World to Casablanca on Royal Air Maroc, or connect through Europe to various Moroccan cities; North Africa is a popular (and recommended) excursion from Spain and France. From Casablanca, Rabat or Agadir, travelers can fly into Essaouira’s tiny airport — a layover that’s probably not worth the time and cost — or opt for ground transport (train, bus, car) for an easy half-day drive along the coastline. A recent proliferation of upscale lodgings, along with the inevitable AirBnBs, lets you choose between sea views, seclusion and the lively, noisy action downtown. For generations of Sephardic Jews, this windswept port city was a haven. Merchant families were welcomed to the city by an open-minded sultan in the 1700s, and by the 19th century, Jews constituted nearly half the population. Today, few Jews remain; most emigrated to Israel, the U.S., France or Canada, where Montréal in particular has been a destination for North African Sephardim. In Los Angeles, the Pinto Center synagogue was founded by descendants and followers of Essaouira’s most revered Jewish figure, Chaim Pinto, an 18th-century rabbi whose homestead inspires an annual pilgrimage. Indeed, while North African Jewry may be in decline, Essaouira is trying hard to salvage its unique Sephardic heritage. A few years ago, the Centre Haim Zafrani — an Essaouira-based organization named for the pre-eminent scholar of Moroccan Jewry — announced a project to restore the city’s Jewish sites and eventually establish a Jewish museum and research institute. First priority was the restoration of Essaouira’s Simon Attias Synagogue, a lovely, blue-and-gold chapel named for a 19th-century scholar. Moorish-style arches and brilliant azure tile lay crumbling for decades, and the building is still undergoing renovation. Nearby, the Chaim Pinto Synagogue is a historic site that preserves the home base of Essaouira’s most famous Jew — a galvanizing figure, both heir and patriarch of a rabbinic dynasty, who continues to unite the Moroccan-Jewish diaspora. The Pinto shul lies just outside the city’s fortified wall; its courtyard is a gathering spot for Jewish tour groups (a guide is recommended for heritage travelers, since English signage is scant). On the anniversary of the rabbi’s death, Moroccan Jews return each year to pay homage at Pinto’s tomb, amid the flat, sun-baked stones of Essaouira’s Jewish cemetery. Landmarks are mostly all that is left of a once-vibrant community, whose minor-key tunes and oral poetry tradition form a rich Sephardic legacy. We can only hope that the Centre Zafrani will continue its mission to bring that heritage to light. 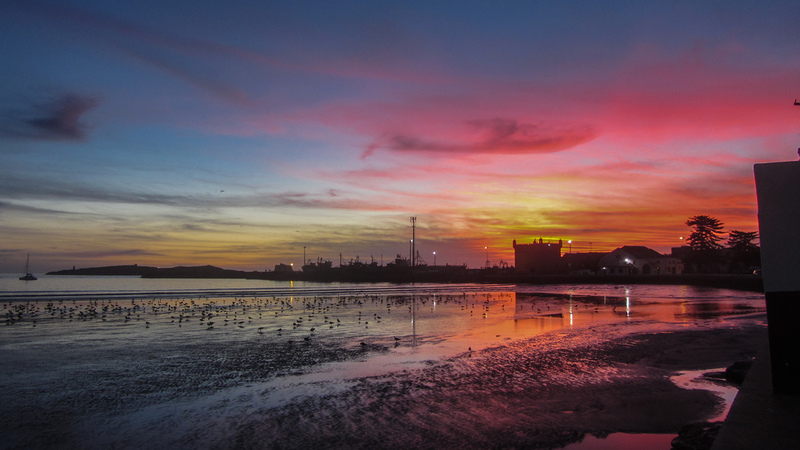 The light of Essaouira, meanwhile, remains its brilliant calling card. Under the African sun, blue, white and gold are the colors that define this shoreline: white seagulls flying over brightly painted fishing boats in the turquoise harbor, cannons lined up by sandy-hued fortifications and stucco alleys that offer both shady respite and a step back in time.